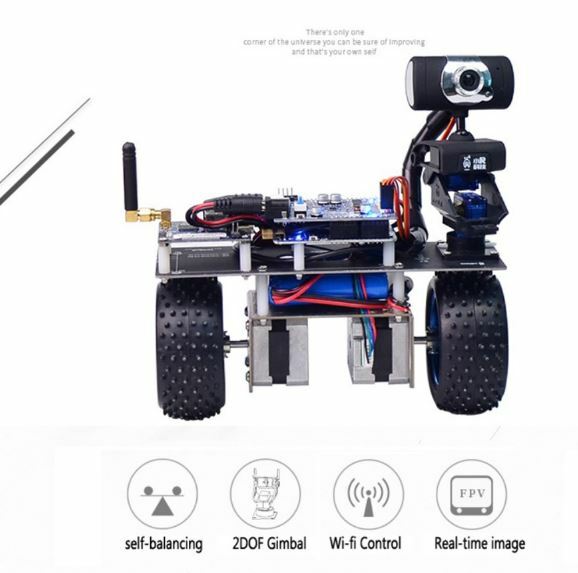 XiaoR _ GEEK STM32 Self-balancing Smart RC Robot Car uses high strength stainless steel which makes it extremely solid and durable. The high-speed motors and premium tracks also allow it to move swiftly everywhere. What’s more, it benefits from a high-performance suspension and enjoys outstanding mobility across even the toughest terrains. Read also: Amazfit Cor 2 fitness band With 1.23-inch color touch screen & NFC function Offered For $90.34? 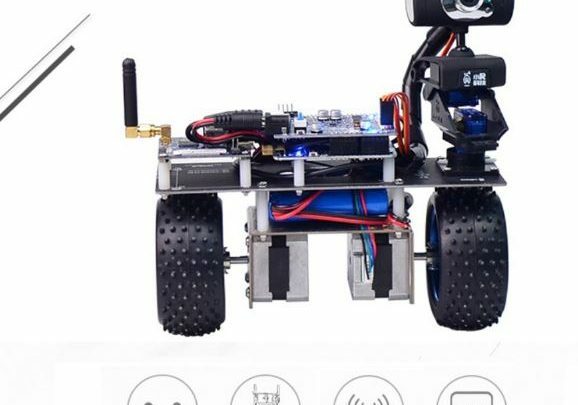 The XiaoR _ GEEK STM32 Self-balancing Smart RC Robot Car is made from Stainless steel which makes it very strong and ready to match up any terrain. 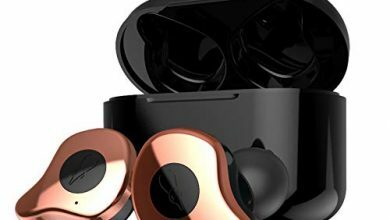 It is embedded with an HD adjustable camera module on the platform, you can view the image and video taken in the smartphone or PC by WiFi in real time. The 2-axis pan-and-tilt servos enable the camera to take video at any angle without moving the car. The HD camera with manual adjustment of focus and a maximum resolution of dynamic video can be up to 640*480P, Frame up 30F/s. It can be controlled using an APP via smartphone. 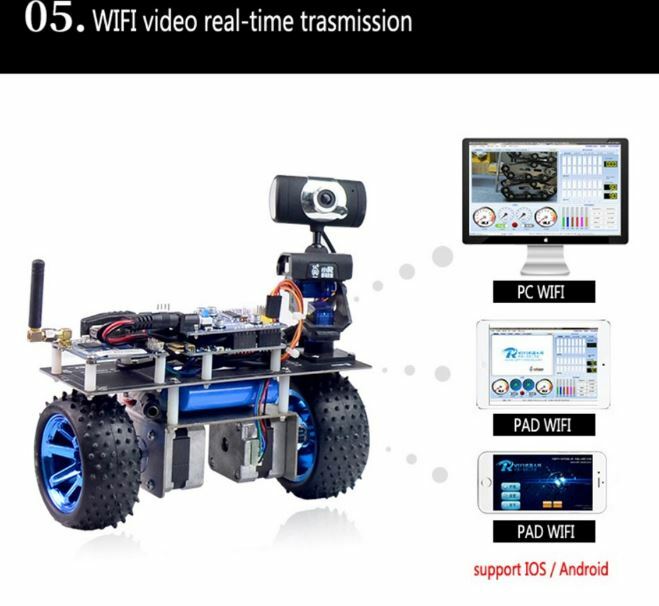 It Automatically self-built signal hot point after power on, and support computer web browsers, smartphone and tablets APP(iOS/Android),PC to control the robot car. Real-time image transmission – Adjustable Hd camera two degrees of freedom steering cloud terrace with a USB Wi-Fi adapter so you can check the video in a real-time manner on your PC or any smartphone. Dynamic video resolution can be up to 640*480p, Frame up 30F/s. It comes with a built-in 2200mah 8A lithium battery, Support powerful and long-endurance Playing time With 12V lithium battery charger. Software support, english user interface, compatible with Android, iOS, PC etc. 1. Graphical programming interface – Support the drag-and-drop graphical programming software, just plug and play, get what you see, easy for the Raspberry Pi robot learners. 2. 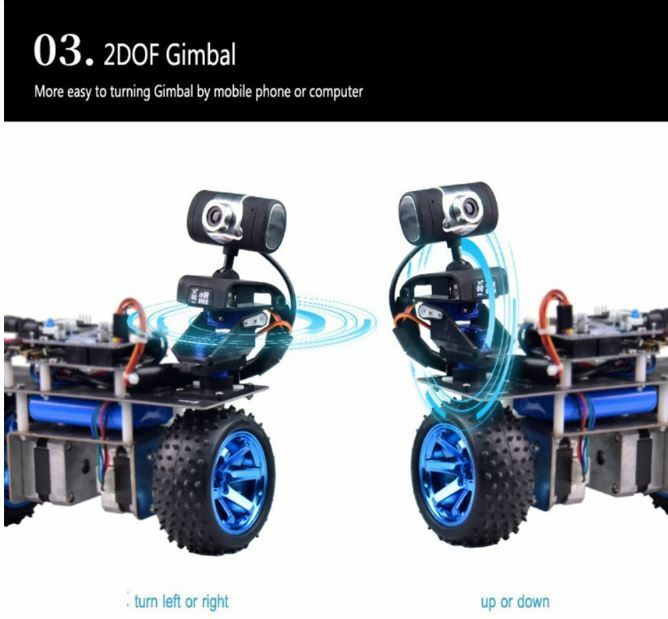 Designed with 4-DOF robot arm and 2-DOF robot pan-tilt kit, enjoy much of the freedom of the control angle. 3. 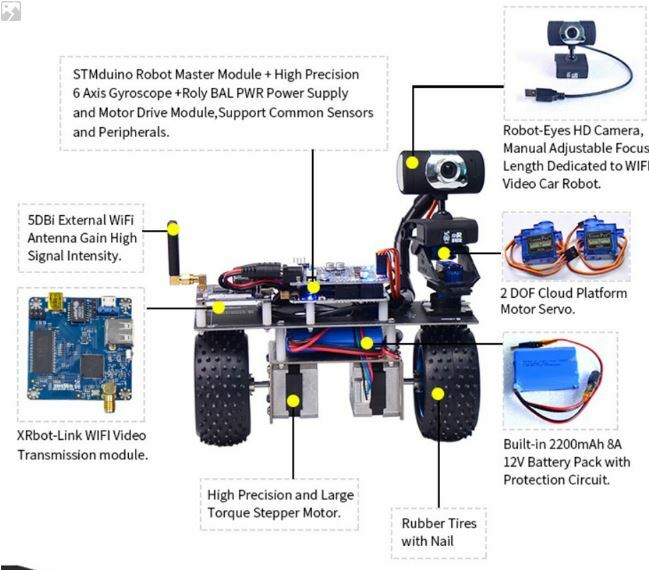 Multi Speed Control System for you to control the speed of the robot. 4. Power system: Double dc gear motors, planetary gear box, 12W, 1.5W, Degree of climbing: 30°.